Summary: An oil portrait of Sir James Timmins Chance seated in a study. He is dressed in a black Victorian suit with a white shirt and a black tie. In his hand he is holding a letter and on the desk to the left sit some loose pages. Description: Joseph Gibbs the artist was based in Smethwick. He exhibited works at shows organised by the Royal Birmingham Society of Artists. He also painted the portrait of Mrs Edwin Richards that you can see on the main stairwell at Wednesbury Museum. Originally this portrait hung in the Smethwick Council House. The painting was presented to the Smethwick Borough Council on the 16th December 1902. 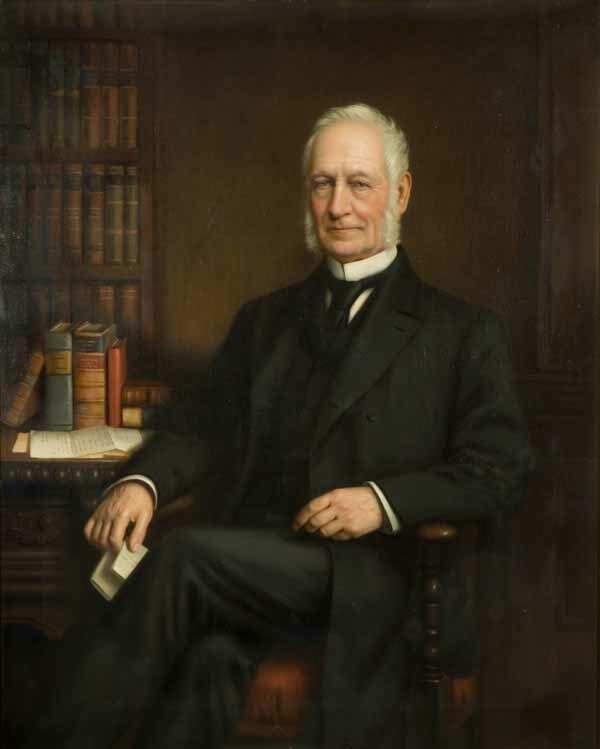 Sir James had died on the 6th January 1902. It is not known whether the portrait was painted while he was alive. Sir James Chance was born in 1814 and was the eldest of six sons. His father, William Chance, owned the Chance Brothers Glassworks which had been founded in 1824. 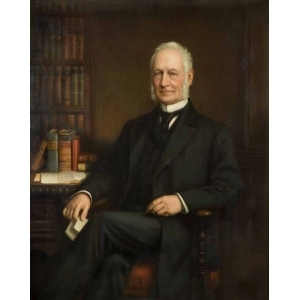 Sir James worked with his father and uncle at the factory and was responsible for designing glass lenses for lighthouse lamps. Chances Brothers were well known for their production of lighthouse lenses.